Edwin J. Torres/Mayoral Photography Office. Mayor Bill De Blasio’s announcement this morning that he would push the state legislature to pass a “Millionaire’s Tax” to fund subway improvements and reduced-fare metro-cards received strong reactions from the MTA, Albany, and mayoral challengers. “…Emergency train repairs can’t wait on what the State Legislature may or may not do next year,” MTA chair Joseph Lhota told the New York Times, with Cuomo making similar remarks. The proposal would raise the income tax by half a percentage point for married couples making more than $1 million or individuals making more than $500,000. City officials say it could raise $700 to $800 million in revenue, of which $250 million would go to funding reduced-fair metrocards. But what about advocates who have long advocated for lower-priced metrocards for the city’s low income residents? Did they view it an election-year stunt, or were they more angry with Cuomo for his quick dismissal of De Blasio’s proposal? We’ve started collecting responses from the city’s transit advocates. Send yours to abigail@citylimits.org and we’ll add it below. New York is experiencing a crisis in our subways. Delays, unreliable service and unsafe station conditions are affecting the economy, environment, and health of our region’s residents, and they absolutely must be addressed. The solution will require everyone involved – political and civic leaders, riders, businesses, and the men and women who work at the MTA – to come to the table, pitch in and help out. RPA applauds Mayor de Blasio for supporting social fares for those who need them. They are part of expanding economic opportunity and mobility. The Mayor could pay for fair fares through the city general fund, however, and not wait through the long, laborious process of securing state legislative approval. The MTA also needs more dedicated revenue, which is why RPA has long supported congestion pricing and other proposals to bring new resources to crumbling transit system. However, new revenues should come from those who benefit from our transportation network, and they should include a package of reforms at the MTA so the public’s money goes farther and riders see improvements quicker. RPA does not oppose an increase in income taxes, but we also don’t think they are the most appropriate way to fund our transportation network. Mayor de Blasio’s statement is a step in the right direction. RPA urges Mayor de Blasio and Governor Cuomo to work together to fix the very real transit crisis at hand and advance longer term funding proposals and reforms. Vanterpool added that she would also like to see the mayor consider congestion pricing, something that the Times reported Cuomo may be starting to look into. “Everyone has something to learn about being open to new ideas,” she says. 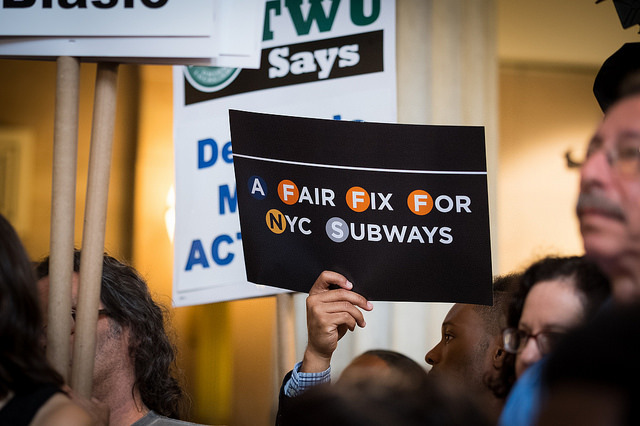 We commend the Mayor on his plan (and for his support of Fair Fares which would help hundreds of thousands of New Yorkers gain access to the transit system). In addition, we hope that both the Mayor and the Governor are open to the idea of congestion pricing, which would not only provide sustainable funding for transit but do more to ease congestion on city streets. If we’re going to find new and sustainable ways to fund transit, why not kill two birds with one stone? While it’s a relief that Mayor de Blasio has acknowledged that his administration has a role to play in fixing New York City’s subways, and has come around to support for Fair Fares, it’s uncertain that this proposal would survive Albany, as a tax increase will require approval from the Legislature and the Governor. Nor would this proposal do anything to address the crippling congestion that costs New York City billions of dollars annually in lost productivity, and countless more in health and environmental effects. The unacknowledged equity issue is the tremendous cost that drivers exact on everyone else in New York City. The Move New York plan would generate significantly more dedicated funding for the MTA while also reducing congestion, and some legal experts believe that the city can enact a version of it without Albany’s approval. It’s time to find out if they’re correct. Meanwhile, the person who bears the ultimate responsibility for the MTA – Governor Cuomo – could render that question moot by using his considerable influence to advance the Move New York plan in full, putting our vital transit system on a path to good repair and solid financial footing. The stakes are too high for half-measures, however well intentioned. Debate Fact Check: Is Congestion Pricing Regressive? The mayor says it is, and that’s a reason why he wants to fund transit improvements with a millionaire’s tax instead.